B King was out visiting the Faux Farm a week ago and decided to cut some of my hydrangea blooms. She said those blooms were like gold. She cut the blossoms, stripped all the leaves and laid them in the driveway for the entire day to dry out. 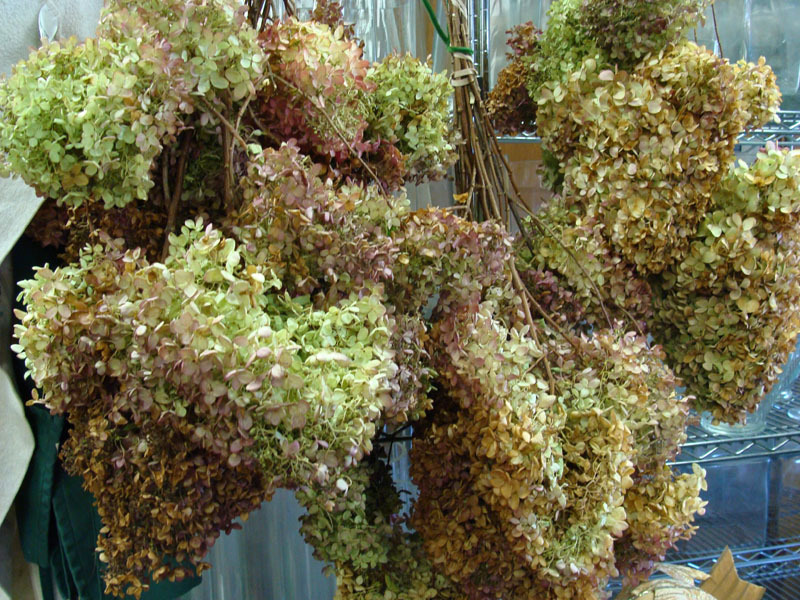 Then she tied them up with twine in bundles of 4-5 blooms. She took them back to her shop and let them hang for a few days. This may be the only thing I grew on the farm this year that had any value to anyone. The Faux Farm does not produce any useful agricultural products and I like that way. It takes the pressure of me. I may plant a few more of these trees since they seem to grow well all by themselves and that is the kind of vegatation we like. Self sufficient gardening! It’s the faux farm way. Here we are a B.King’s Flower shop. She is now going to show us how to make a wreath out of the bounty she took from the Faux Farm. 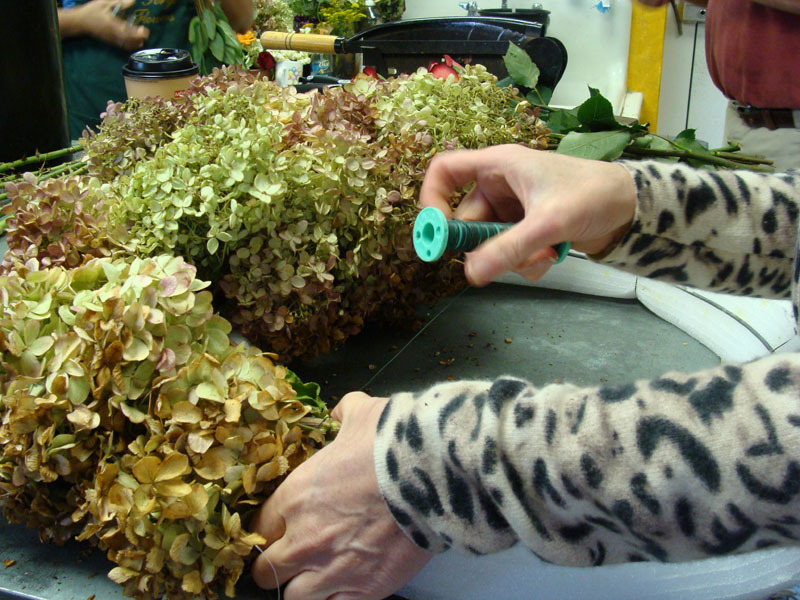 Sit back and watch- this is the first time we are trying this tutorial floral lesson. 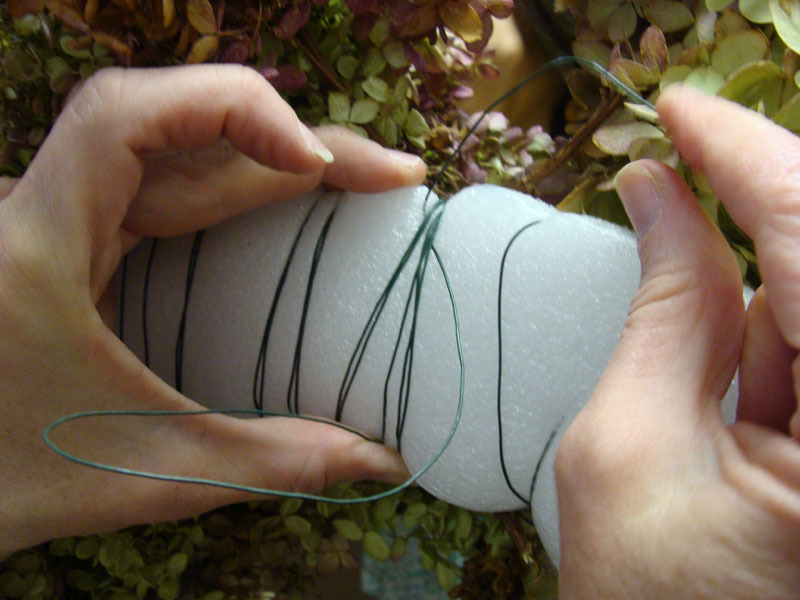 Lay a 10 inch piece of wire on the back of the wreath form and then wrap more wire around the straight piece of wire about 8 times – this will hold the end in place. 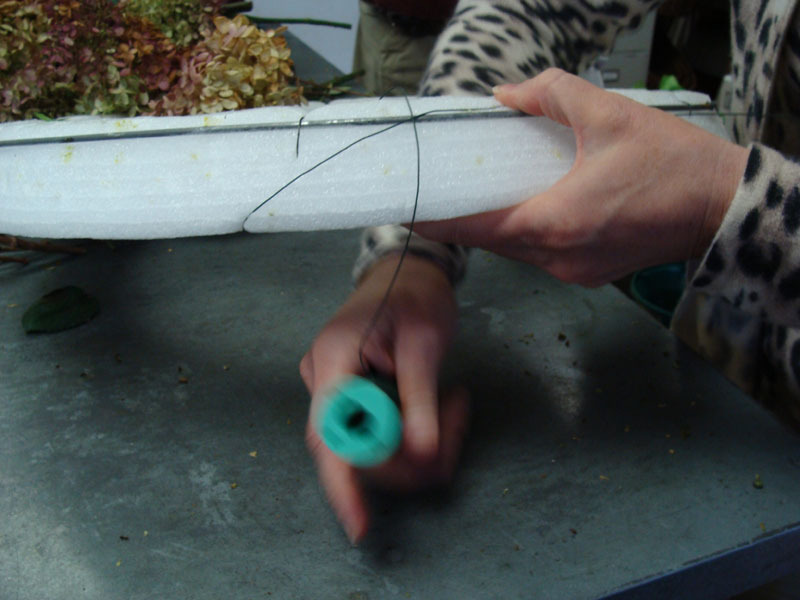 Now add a bloom by placing it on the front and wrapping the wire around it several times. 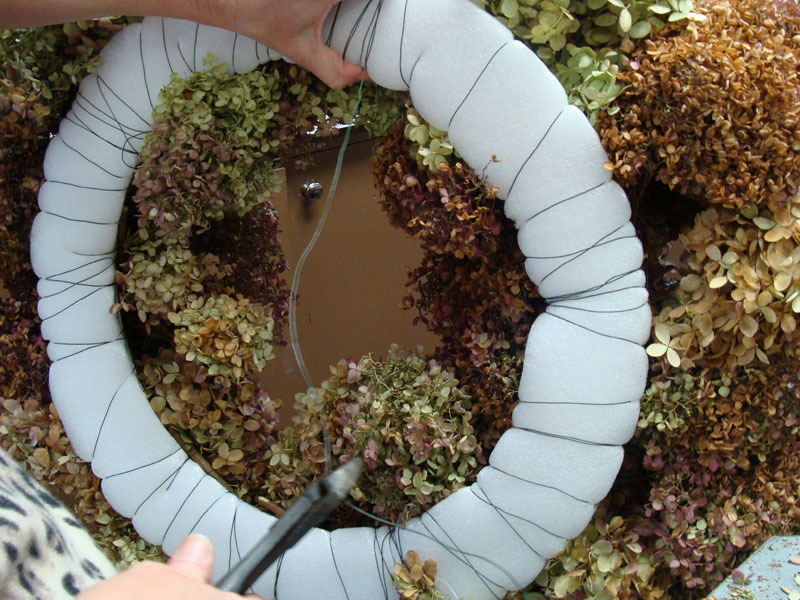 Add another bloom so that the blooms overlay each other and start to make a full the wreath full. 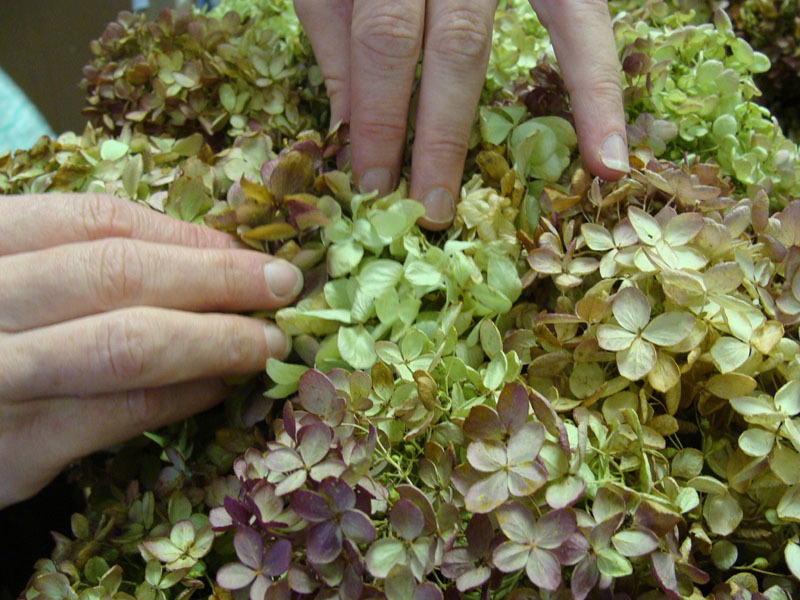 Make sure that the blooms all go in the same direction and that you securely wrap each stem. You will re-wrap some older stems as well and that is just fine. You want to keep the wire TIGHT at all times. 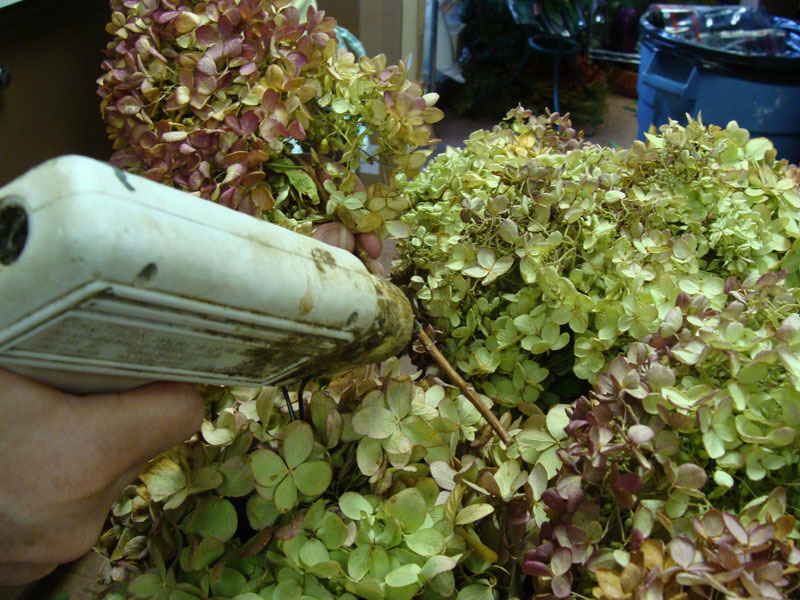 If it is loose – the stems will fall out, and you don’t want that! Keep adding until you have gone completely all the way around. 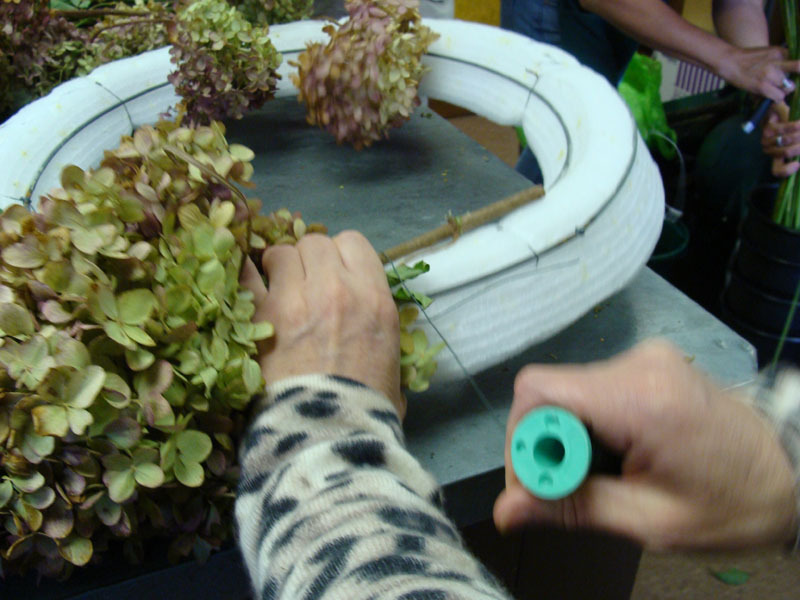 This is the back just to give you an idea of how many times you are going to wrap the wire around the wreath to secure the hydrangea stems. Keep it tight! Now you want to snip off the wire leaving 18 inches at the end. Now stick that long piece under the wrapped wire several times to secure the end. It is very important that you keep the wire tight and pull it through securely or your whole wreath will fall apart. No kidding! It really will. 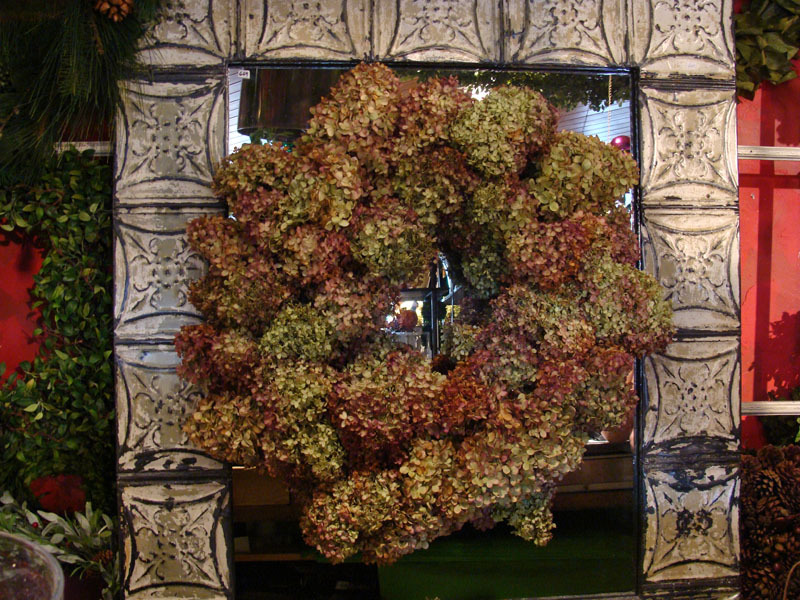 Hold up your wreath and admire your work. Does it look a little uneven? Don’t worry this is natural. 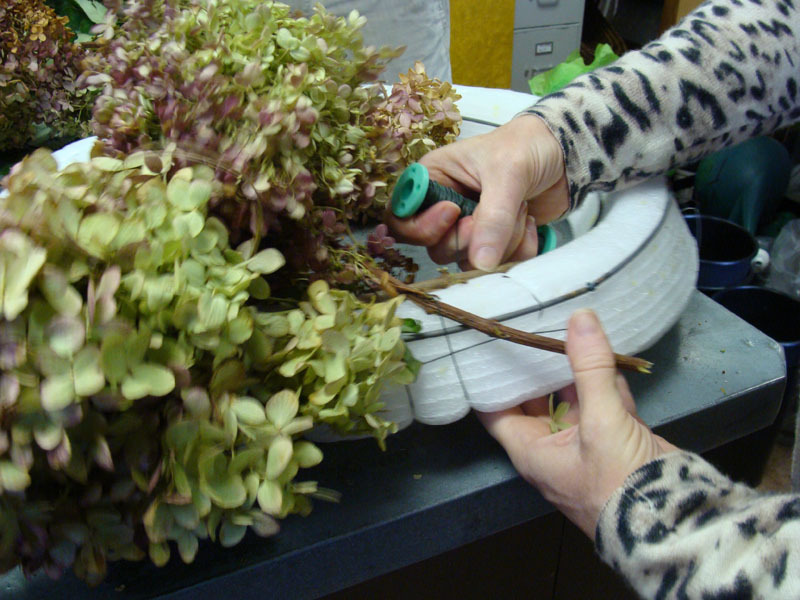 Now you can take that glue gun that you have been warming up and take some additional blooms and add them in where you see “holes”. 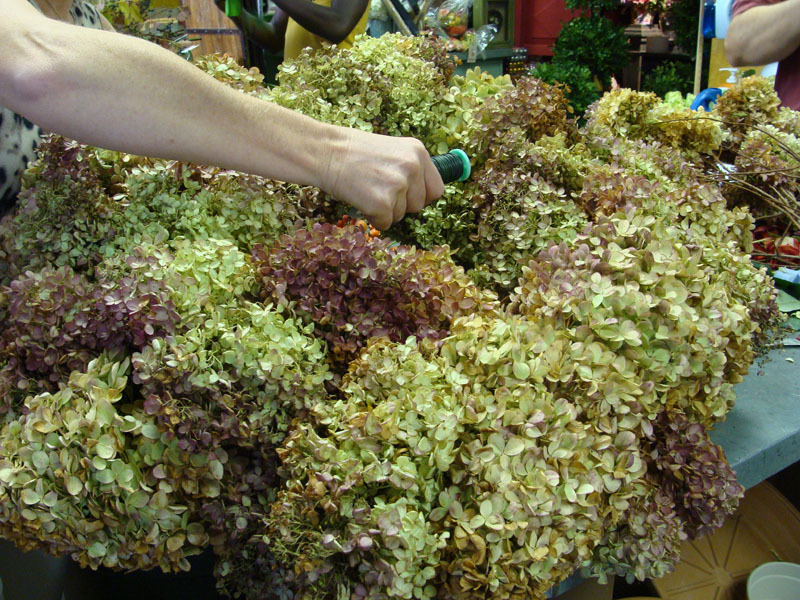 Use your fingers to have the newly added hydrangea’s blend into the wreath. Add a green pipe cleaner twisted around in a loop and secured to the wire on the back the wreath. 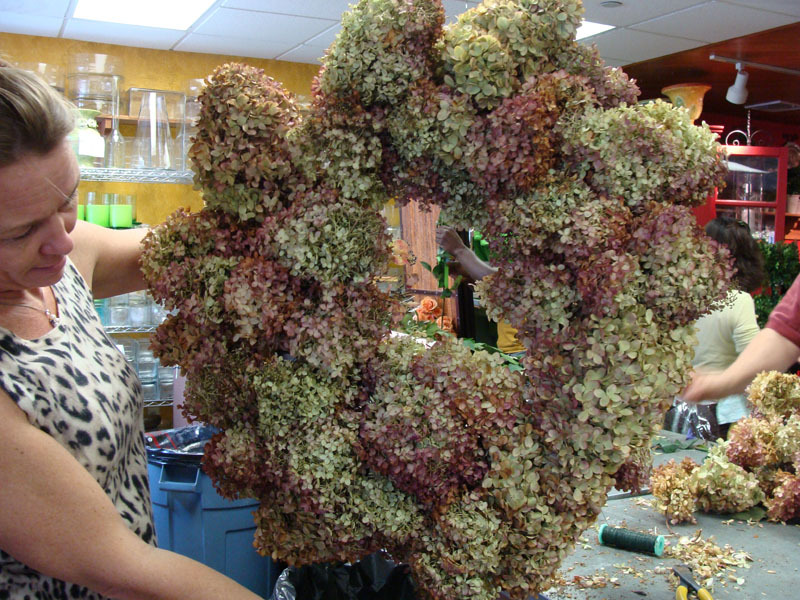 This is what you will use to hang up the wreath. TA DA!! This is the beautiful wreath that we made. And it only took 20 minutes! We all have 20 minutes. Even I have twenty minutes. Remember it is fragile because the leaves are dried. Don’t place it on a door where it will get squished by a storm door glass or where the constant movement will shake the petals off. On the wall or over a mantel is a great location. 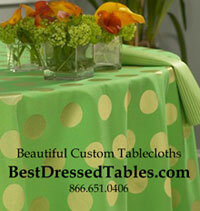 Not that I am telling you how to decorate. I am just saying. Now time to gloat. We made this ourselves, with our own hydrangea blossons, from our own yard. We are so proud of ourselves. 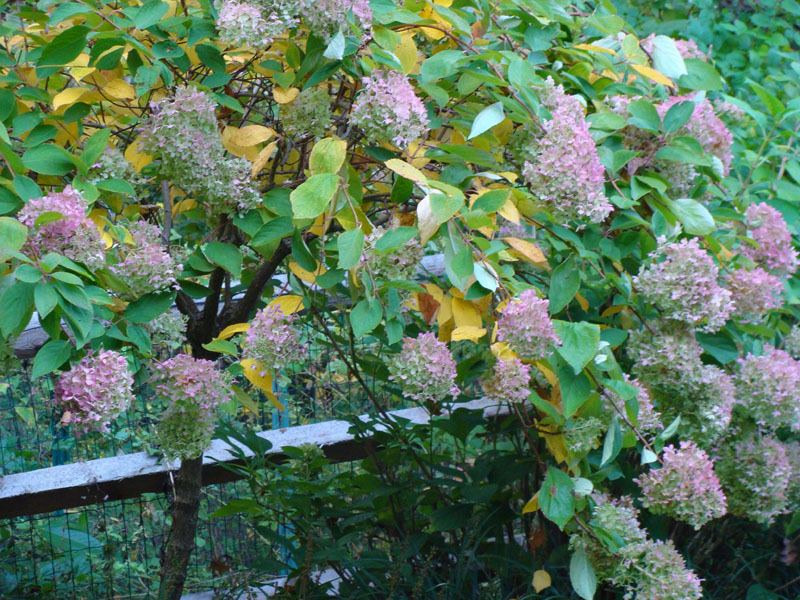 If you don’t grow any of these hydrangea trees, buy one next spring, they aren’t expensive and actually look great will growing. Plus you get to make the great wreath. OR, you may have a friend that has one and you can get some of the blossoms from her, if you ask nicely and promise her a wreath. Otherwise- wait until dark and cut them off her tree under the darkness of night and keep the wreath for yourself.